- Injury Report: For the Raptors, Jonas Valanciunas is out with a dislocated left thumb and Kyle Lowry is out with lower back pain. For the Jazz, Grayson Allen (right ankle sprain) is out. Jae Crowder (left thumb contusion) and Ricky Rubio (left low back and left knee contusions) are listed as probable. - New Year’s Day: The Raptors will kick off the 2019 portion of their season at home against the Jazz, following a 95-89 victory against the Chicago Bulls at Scotiabank Arena on Sunday. Toronto held on for the grind-it-out victory behind a 27-point performance from Kawhi Leonard and a 20-point, 12-rebound double-double from Pascal Siakam. The Raptors defeated the Bulls despite shooting 37 percent from the floor and just 27 percent from the three-point line. Kyle Lowry has missed seven of the last eight games, while Jonas Valanciunas has been out for eight straight games since dislocating his thumb against the Golden State Warriors on Dec. 12. - Recent history: This will be the final regular-season meeting between the Raptors and Jazz this season. Toronto notched a 124-111 victory in Utah on Nov. 5 during a back-to-back on the team's first 4-0 sweep of a west coast road trip in franchise history. Kyle Lowry had 17 points and 11 assists to lead the Raptors as Serge Ibaka, Fred VanVleet and OG Anunoby also scored 17 points, and Pascal Siakam added 16 points in the absence of Kawhi Leonard (sprained ankle). The Raptors shot 57 percent from the floor, 39 percent from beyond the arc and 93 percent from the line in the victory. Alec Burks led the Jazz with 22 points in the loss. Burks is now a member of the Cleveland Cavaliers. - Spicy double-double: Pascal Siakam had another solid and much-needed performance for the Raptors against the Bulls. With Kyle Lowry and Jonas Valanciunas out of the lineup, Siakam came through with scoring and rebounding and even some assisting to help make up for their absences. 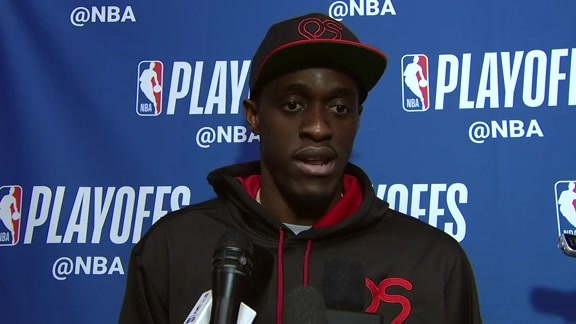 Siakam played 34 minutes against the Bulls and finished with 20 points, 12 rebounds and four assists, shooting 7-for-12 from the floor,1-for-1 from beyond the arc and 5-for-6 from the free-throw line. He is averaging 14.5 points and 6.5 rebounds per game this season. - 2019 things: Toronto’s victory over the Bulls on Sunday moved the team to 27-11 to close out 2018. With 38 games played over 11 weeks between Oct. 17 to Dec. 31, the Raptors go into the new year knowing the remaining 44 games on the regular-season schedule will be played over 15 weeks, that they will not travel past the central time zone again, and that the bulk of their west coast trips are already out of the way. Toronto also doesn’t have a road trip longer than three games on the schedule in the new year. - Familiar faces: Raptor C.J. Miles was drafted 34th overall by the Utah Jazz in the 2005 NBA Draft. He spent seven seasons with the Jazz. Raptors guard Delon Wright attended the University of Utah, winning the 2015 Bob Cousy Award as the nation’s top point guard. Jazz guard Naz Mitrou-Long was born in Mississauga, Ontario.